Please not Responsibilities cannot be deleted in Oracle Apps from a User. It can only be Disabled or End Dated. 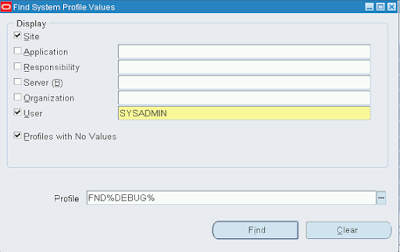 What is FND Debug Log ? It helps you pinpoint the cause of error in standard Oracle Code, by making debug messages to appear in a centralized table named FND_LOG_MESSAGES. You can design and build your custom extensions in a manner that can easily be debugged. This can be done by calling Oracle delivered API’s in your custom code. A program written in any technology, either form, report, PL/SQL, java concurrent program, OAF has their debug message stored in FND_LOG_MESSAGES. 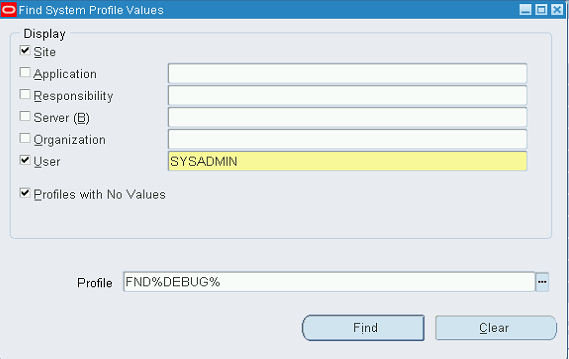 How to use FND debug Log to pinpoint the error? If the error pertains to a specific module use the application short name. Step 3: Run the test case, avoiding extraneous steps to avoid stacking the table. 5) Then navigate to the above screen and download the complete fnd log messages report by exporting as a CSV.